Valtech Co. offers innovative toys designed to hold a child's interest and attention, build critical developmental skills and promote imaginative play and creativity. 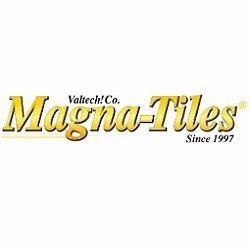 The Valtech Magna-Tiles line of colorful building toys have gained popularity among thousands of preschools nationwide and continue to enjoy strong response from teachers, parents and kids. Magna-Tiles Cars Expansion 2 pcs. Magna-Tiles Clear Deluxe 48 pcs.